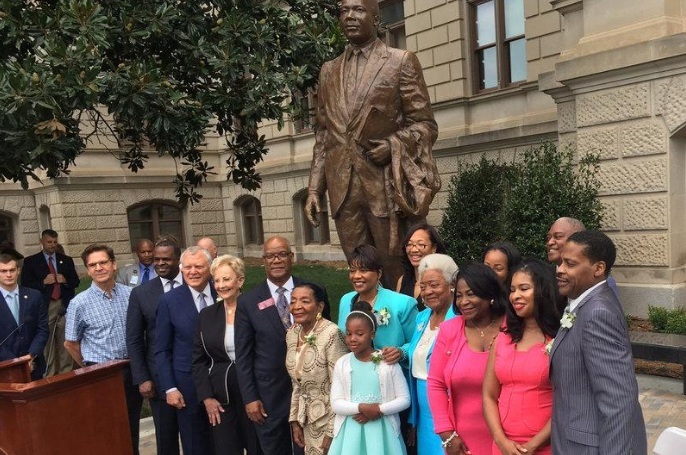 ATLANTA - Georgia on Monday unveiled a statue of the late civil rights leader Martin Luther King Jr. on the same capitol grounds in Atlanta where statues of segregationists remain. The new installation comes amid an intensified debate in the United States over Confederate symbols after a woman was killed during an Aug. 12 protest by white supremacists in Charlottesville, Virginia, objecting to the planned removal of a statue of Confederate General Robert E. Lee. The bronze King statue should provide a sense of hope, his daughter Bernice King told the several hundred people who attended the unveiling ceremony in the state that was part of the Confederacy during the U.S. Civil War. The event on Monday was timed to coincide with the 54th anniversary of King’s “I Have a Dream” speech calling for racial justice and equality. The civil rights leader said it was his dream that the sons of former slaves and former slave owners would one day sit down together in brotherhood. ”Well, the sons of former slaves and sons of former slave owners sat down in this state capitol and made the decision to erect the Martin Luther King Jr. monument,” Bernice King said. King, a Nobel Peace Prize winner who was assassinated in 1968, was born a few blocks from the Georgia capitol. Although his portrait is on display inside the building, there had been no monuments to him on the Capitol grounds. The statue faces his birthplace. The monument to King joins existing statues on capitol grounds of John B. Gordon, a Confederate military general; Joseph Brown, the state’s governor during the Civil War; and past Governor Eugene Talmadge, a staunch segregationist. Georgia state officials in 2014 announced plans for the King statue a few months after they quietly relocated off capitol grounds a statue of Thomas Watson, a U.S. senator who died in 1922. Watson espoused bigoted attitudes towards African Americans, Catholics, and Jews, according to scholars. "This day took much too long to get here,” said David Ralston, the Republican speaker of the Georgia House of Representatives. "From those days we can grow and learn."